Tyler Q. Swensen has been practicing in Arizona for over 20 years, during which time he has had significant trial and appellate experience in the areas of commercial law, employment law, property tax appeals, construction law, family law and personal injury cases. Since completing a one-year clerkship for the Honorable Edward C. Voss, at the Arizona Court of Appeals, Mr. Swensen has practiced with several large and small litigation firms in Arizona, as well as on his own as a sole practitioner. He is admitted to practice in Arizona’s state and federal courts and recently expanded his practice to include property tax appeals. Mr. Swensen received his Bachelor of Science Degree in Nuclear Engineering from the University of Arizona in 1986. After working for several years in the Aerospace and Telecommunications fields, he returned to school and received his Juris Doctorate degree from Sandra Day O’Connor College of Law in 1993, graduating in the top 21% of his class. Mr. Swensen was the senior student editor for ASU Law School’s Jurimetrics Journal and received numerous honors and awards during Law School both for his writing and oral argument skills. He was named “Outstanding Advocate” of his law school class. 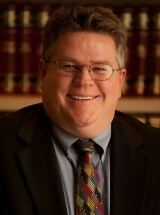 Mr. Swensen is a member of the Arizona State Bar, Employment Law Section and Construction Law Section and since 2003 has been teaching graduate-level employment law and administrative law courses to masters candidates, as an adjunct professor at the local campus of Webster University, St. Louis, Missouri. He also speaks fluent German and has represented German citizens who were forced to defend themselves against lawsuits in Arizona. Mr. Swensen is currently one of three Senior Associates at Wilenchik & Bartness. In that role, he is responsible for supervising and mentoring three junior associates and directing their activities and reviewing their work product.